Amsterdam Oost is a welcoming neighbourhood known for its fantastic nightlife and array of dining options. Here you'll find plenty to visit, including Museum Perron Oost and Dappermarkt. 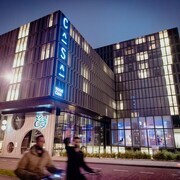 Book your hotel now and use Amsterdam Oost as your home base for exploring the sights in and around Amsterdam. 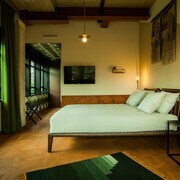 Breitner House: 5-star guesthouse featuring free breakfast, a restaurant and a rooftop terrace. Our guests enjoy the guesthouse's spacious rooms and breakfast. 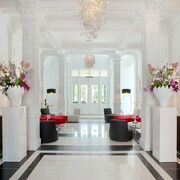 Hotel V Fizeaustraat: 4-star hotel featuring free breakfast, a restaurant and a bar/lounge. Expedia travellers like this hotel's comfortable rooms and walkable location. 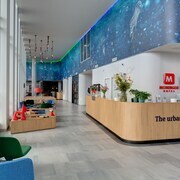 Hampton by Hilton Amsterdam Centre East: 3-star hotel featuring free breakfast, a restaurant and a 24-hour fitness centre. Our guests rate this hotel highly for its spacious rooms and breakfast. 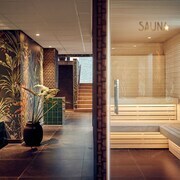 Movenpick Hotel Amsterdam City Centre: 4-star hotel featuring a restaurant, a health club and a bar/lounge. Expedia travellers like this hotel's spacious rooms and central location. Lloyd Hotel: 3-star hotel featuring a restaurant, a bar/lounge and free WiFi. Our guests rate this hotel highly for its comfortable beds and central location. Sights like Museum Perron Oost, Tropenmuseum and Pakhuis De Zwijger can be part of your cultural tour of Amsterdam Oost. Dappermarkt and Oosterpark are a also couple of sights to visit when you're in the neighbourhood. Eastern Docklands is a nearby neighbourhood, and you might want to check out some attractions like Museum Perron Oost, Pakhuis De Zwijger and Passenger Terminal Amsterdam while you're here. Other places worth visiting include Bimhuis Theater and Muziekgebouw aan 't IJ. If you want to see more of the city, Amsterdam Amstel Metro Station is the closest metro stop. Others nearby include Wibautstraat Station and Spaklerweg Station. If you're considering venturing out of town, train travel is a great option. Amsterdam Science Park Station is the closest train station, but Amsterdam Muiderpoort Station and Amsterdam Amstel Station are also close by. You can enquire about options for water travel at the port.